If you are searching or planning to buy a used car, motorbike or any other vehicle; you need to verify ownership record, excise taxation record and other documents carefully before making any deal. In the past, it was a time taking process to get verification of vehicles. But now advanced technology has made it very simple and efficient. Now you can get all necessary details about ownership of any vehicle just by sending an SMS or through Internet. You can also get information about Excise and Taxation; either it is paid or not. You can try following ways to verify details of any vehicle or to identify stolen vehicles. However, if any of these do not give you required information, you should contact relevant government authorities for any help or information. Islamabad Police has introduced this useful service with the help of Digital Seal Company, at Rescue 15. Any Pakistani citizen can get information about any Islamabad-Registered-Vehicle through this service. Any person from anywhere within Pakistan may send Chassis No. of the vehicle to 8521 and you will shortly get details on your mobile phone. This is called Stolen Vehicles Identification System (SVIS). This system is designed to locate lost car and to discourage resale of stolen car. Here the RNO is Registration Number, ENO is Engine Number and CNO is Chassis Number. Process is very simple. Just enter registration number of the vehicle in the box given at the bottom of this web page and it will return the details (Registration Number, Chassis No, Engine No. Make Name, Registration Date/ Time, Price, Year of Manufacture, Color, Owner Name with Father Name, Owner City) within seconds. Try different variations of the number e.g. XYZ 123, XYZ 0123, XYZ-13-123. This website has records of 6.5 million vehicles. Motor Registration Authority (MRA) Lahore has its own website, where you can search record of a vehicle which is registered in Lahore. Majority of Pakistani people often like to buy second hand cars and often get trapped in the deal of a stolen car and eventually loose both money and car. This identification system not only provide speedy info but also has resulted in decrease in the number of car theft cases. It is the liability of Buyer and Agent to verify all the credentials before making any payment to the seller.Police and other law enforcing agencies should also play their roles in this regard more effectively. WHERE IS OLD NOS VERIFICATION RECORD? 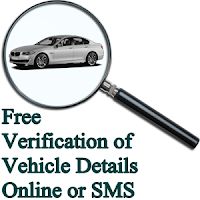 How can I check Islamabad number vehicle online? enter your registration no. there and everything will be displayed. You can check the Vehicle Details, Ownership Details and the Transfer History of any Vehicle registered in Punjab, Sindh & KPK provinces, Pakistan. Just enter the vehicle registration no and the app will loop-up the details and show you the complete information about the vehicle, even the Engine and Chasis No. We are getting the vehicle details form the Motor Transport Management Information System (MTMIS) of Punjab Govt. and KPK & Sindh Excise Department Websites. Please help, How can I verify the Gujrat Registered car, having old number and old book. ISLAMABAD verfication not found ???? Awf970 black honda.sir i badly need ur help ,i want to know the name n cell no of the owner of the aboementioned car.today the person has dameged the bumper of my car n ran away.need to know cell no n name of the owner of the car.tnks Mrs..mehmood ALNOOE DEELOPMENT ORGANIZATION. Can We Check & Verify Through Chaises Numbers ??? Hi. Nobody is helping out to find out details of islamabad no cars online. No website, No App, No response. 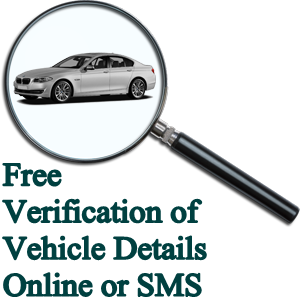 Dear All, how can i verify my Islamabad number car, through sms or any other online system. May I know the verify owner name thanks..
You can yourself know the details of any Punjab registered vehicle. i need information about this car need help admin. i need ur reply as soon as possible. This blog is meant to only provide information. We are unable to help you in such cases. You should contact with relevant government departments. how can i verify the karachi no car. please suggest the site. 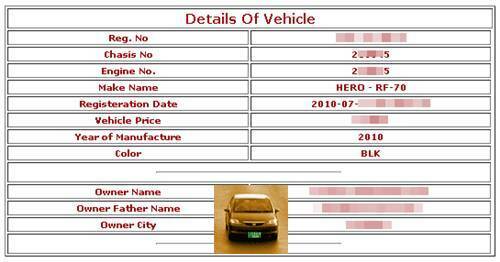 How to verify if Lahore registered car is clear or stolen or having any police record. SMS 8521 is no more working. Sms number to chk islamabad number? Details of this number are also available. But you have to type this number in the form of RNB 8705.